Outsourcing, as a field, is a great alternative to many boring things you do not want to do in house, or you do not want to waste precious resources – human, as well as material – on. SEO is a very particular area of interest, and getting someone in your company to become a SEO expert overnight, even if they are some kind of whizz-kid, is hardly doable. Do we have anyone capable of doing this kind of work? To get any return on potentially significant investment in SEO you need someone who knows the ins and outs of Google’s complex search algorithms. If you do not already have a SEO guru on staff training is the only option. But before you put an employee – or even yourself – through some heavy duty SEO training, with not necessarily guaranteed results, think about how much money and time you would need to invest before chosen student reaches the required level of expertise. Of course, next in line would be to hire a SEO expert for your company. A few issues here – first, it’s not easy to find decent SEO experts. Another issue comes from the fact that SEO might be not a full time / long term activity for your company, and finally, you need to decide whether paying a full time employee is financially more attractive than outsourcing your SEO to a contractor. SEO is the kind of marketing that does not offer results overnight, so it may be more difficult to decide whether the effort is worth the pain or not. Any company when deciding whether to outsource or not to outsource, runs a cost versus time calculation. This is exactly what you need to do, too. Cost savings makes the world of outsourcing spin. If the numbers show that hiring a SEO company is much more effective than doing everything in house, then the answer is right in front of you. Most probably, your company has a very specific personnel structure. Trying to get some of the people who already have clearly designed tasks to work on the SEO campaigns you are planning can lead to overworking and, lastly, poor results. Don’t waste your precious resources on in house SEO and hire someone who would do the job better instead, while only asking for money. To put it bluntly, would you paint your house yourself, or would you hire someone else to do it? SEO and other forms of online marketing are today’s bread and butter for any marketer, but they do not have to be yours, too. When you are dealing with highly specialized skills, it is highly impractical to hire someone else to do it. If your SEO campaigns are goal oriented, relatively short term, or, on the contrary, you have a plan of getting them to become part of a routine that no one in your company is a good fit to do, it is a good idea to outsource. Let’s face it. It’s a dog eat dog out there, and when it comes to SEO, if your competition is fierce, you need to stay on top of the game. Chances are your competition is already using some good SEO experts, if their names or websites appear in Google searches, and yours are lost somewhere on the next pages. In short, if you want to really get a competitive advantage over the other players on the market, you should consider getting a professional SEO team to work on your online marketing strategy. This is actually the simplest and most convincing way to tell if it’s the right time to outsource. If you have already tried doing things on your own, and everything proved inefficient, then it is the clearest sign you can get that you need to outsource your SEO to someone who knows their stuff. Optimizing your website and other digital marketing content for your company can become an ongoing process. If the fundaments are right, and you feel like a large part of your company’s efforts to get noticed in the online environment must be placed in taking care of SEO, then it may not be such a good idea to outsource. While there are plenty of companies specialized in SEO that offer routine services, they mostly work on per project basis, and they may not have that much time at their disposal to take care of routine tasks that even someone without that much knowledge in SEO can do . Companies may need, even when it is about SEO, good, reliable employees to take care of their marketing strategies. If your business is part of a highly specialized field, where the need to know the ins and outs of the industry is a must for the person or team in charge of SEO, it would be a better idea to keep things in-house instead of outsourcing them. Educating an employee or more in learning SEO, particularly for your company and your business, will no longer be a waste of money. Someone who intimately knows your business will not treat you just like the next client, but will pay close attention and treat your business as unique. In case you have a plan to hire long term, then you can settle for a hybrid solution. For instance, if you want to set up a website that is optimized for search engines, but you do not have the necessary personnel on staff, you should consider getting help from a company outsourcing SEO services. If SEO will play an important part of your marketing strategy for years to come, it is not so bad to consider recruiting the necessary workforce for handling this aspect in-house. When you are settled for such long terms goals, there is nothing more helpful than to stick to your plans and get professionals to work for your company on the long run. There is a little thing that most SEO experts won’t tell you. If you are well established in your niche and you do not have that much competition, there may not be so much need for extensive SEO strategies. Specialized niches have specialized clients and business partners, and anyone knowledgeable of the respective niche and interested in getting in touch with a company selling equipment or services, will use certain keywords to get to you, keywords you are already using in describing your business. The thing with highly specialized niches is that they do not have a high volume of searches daily or monthly from Google and other search engines. But these searches are much targeted, plus, you do not have too much competition on them. Back in the days, when Google keyword tool was freely available, you could easily search for keywords with low competition, so you could adjust your on page SEO for them. As it happens with everything related to your business, you need to have a solid plan, to know when to outsource and when not to outsource your SEO. Establish from the start how much money you intend to spend on SEO, if it is a better idea to do it in-house, or pick a company that specializes in such services, and if you have any plans of hiring experts to work directly from your company. While it is true that everyone and their mother are using SEO today to promote their businesses, doing it without any plan, and without any cost versus time calculations, is a bad choice. Consider your niche, consider the budget you have at your disposal, and consider your competition when you are searching for contractors to outsource your SEO to them. If the money and time you save by hiring someone from outside the company to do it are indeed above what you would spend in-house, then you should get experts to work on your SEO strategy. If, on the other hand, you do not want strangers to offer you cookie cutter solutions, and you need someone in the know about your business and your niche, hiring a SEO expert to call your own is the right way to go. That’s been a long stream of thoughts on a topic that I have to deal with at this time myself. SEO is a necessary evil and over last years it’s grown dramatically – it has become more necessary and more evil. What has been your experience? How do you deal with? 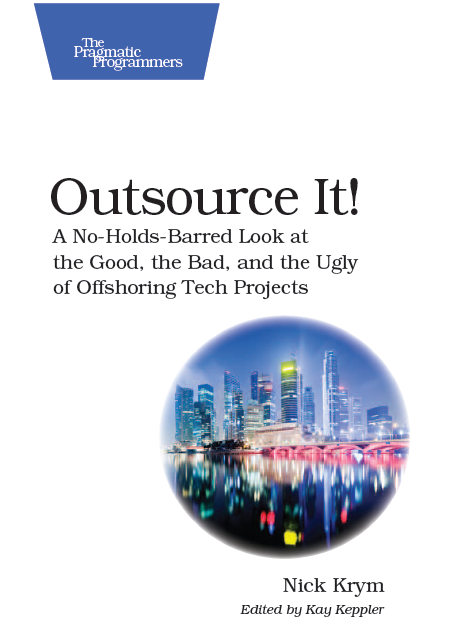 Do you prefer offshoring or outsourcing? Please share your thoughts by commenting on the post or send me an email at krym2000-po@yahoo.com. ← Traveling to China? Check this post first!